All installed parts, except for those identified below, are covered by the Installed Parts Limited Warranty. Dynamic Automotive will install the replacement part, at no charge to the customer, if the original part fails due to manufacturer defect and or workmanship within 36 months or 36,000 miles, whichever occurs first, from the original date of installation. Wear items excluded and other exceptions may apply. Remanufactured engines, transmissions and other major components may be subject to separate warranties, guidelines and conditions set forth by manufacturer and or supplier.Proper break-in service guidelines must be executed to retain warranty. Dynamic Automotive observes these specific warranties, guidelines and conditions. Differential repairs warrantied for 12 months or 12,000 miles whichever occurs first. Proper break-in service guidelines must be observed & executed to retain warranty. Microprocessors and electronics including ECM, PCM, BCM, TCM, EBCM encompassing powertrain management, HVAC, infotainment and communication systems warrantied for 12 months or 12,000 miles whichever occurs first. Commercial vehicles warrantied for 12 months or 12,000 miles whichever occurs first exclusions may apply. Parts covered by alternative written warranty of longer duration not stated in this warranty, may apply, excluding labor. Diagnostics covered for 30 days and /or 1,000 miles whichever occurs first. Brake pads, shoes rotors & drums warrantied to be free from manufacturer defects for 12 months or 12,000 miles whichever occurs first. Warranty does not cover the cost of additional brake parts or associated components (such as Hydraulic components, ABS components, Steering & Suspension components, Drivetrain components, etc…) or the labor to repair the brake system. Tires are subject to the specific warranty provisions as per tire manufacturer and does not apply to tires used on commercial vehicles or any vehicle used for commercial delivery or rental purposes. Tire limited warranty does not apply to tires worn or damaged due to or failures caused by improper inflation, misalignment, improper vehicle maintenance, abuse or neglect, vandalism, fire, off-road use, racing, collision or impact. This warranty applies only to tires used on passenger cars or light trucks. 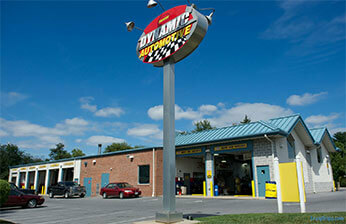 Dynamic Automotive will not install tires that do not meet original manufacturer’s specifications. Warning to customers with new custom wheels. Lug nuts installed on new custom or mag wheels may become loose after initial installation and are required to be re-torqued after the first 25 miles of driving and again at 100 miles. It is the vehicle owner/operator’s responsibility to have lug nuts re-torqued to proper specifications. Dynamic Automotive will check & re-torque lug nuts on the new custom wheels for its customers free of charge and assumes no responsibility for any damage or injury that may occur if the customer fails to have the lug nuts checked. To obtain warranty service, return the vehicle in which the service was performed within the applicable warranty period, with the original repair order to any Dynamic Automotive location during normal business hours. Accidents, collision, fire, theft, freezing, vandalism, riot, explosion, or object striking vehicle. Misusing the vehicle, such as driving over curbs, overloading, racing or using vehicle as a stationary power source. Altering or modifying the vehicle- including the body, chassis, suspension, engine, braking system or driveline. Tampering with original equipment emission system. Disconnecting or altering the odometer so that actual mileage cannot be determined. Using contaminated or improper fuel/fluids. Driving through water deep enough to cause water to be ingested into the engine, transmission, transfer case and front and or rear drive axles. Any part which has failed due to abuse, neglect, improper maintenance or modifications. Maintenance services not warrantied, cooling system services, transmission services, power steering services, brake fluid services, fuel system services, transfer case and differential services. This warranty does not apply to services performed or parts installed on vehicles used commercially or for racing or for off-road purposes. This warranty will be void if the parts are modified, altered, abused, unreasonably used, or damaged by accident, negligence, misuse or lack of proper maintenance. This warranty excludes any incurred expenses due to any warrantable failures. This includes but not limited to transportation expenses, compensation or inconvenience due to loss of use, the cost of a rental car, time off work resulting in loss of income, towing charges, telephone calls, and property damage, food and lodging expenses. Owner/ operator will assume all risk if Dynamic Automotive installed any Video, Navigational, Cruise Control or other add-on aftermarket equipment to vehicle. Dynamic Automotive will not be held liable for any accidents, injuries or damage caused by use of such equipment if not used in conformity within the equipment manufacturer’s instructions, safety precautions and guidelines. By signing or otherwise accepting the terms of a Dynamic Automotive work order, any dispute or disagreement related to services performed, complainant agrees that such dispute or disagreement will be resolved through binding arbitration. Complainant and Dynamic Automotive are waiving the right to a trial by jury or a trial before a judge in a public court. The only exception to this waiver is that you and Dynamic Automotive retain the right to pursue in small claims court any dispute within that court’s jurisdiction. You further agree that all claims must be brought in by you in an individual capacity and not as a plaintiff or class representative or member or otherwise on behalf of others in any purported class, collective, or representative proceeding. Liability under this warranty is limited to the retail price of the service, product or part at the time of purchase, and Dynamic Automotive and the manufacturer shall have no liability whatsoever for any consequential or incidental damages. The limited warranty above is the only expressed warranty made by Dynamic Automotive with regard to such service, product or part. The duration of any warranty implied by law, including the warranties of merchant ability and fitness for particular purpose, is limited to the duration of this express warranty. The foregone warranties are exclusive and in lieu of all other remedies. Some states do not allow limitations on how long an implied warranty lasts or the exclusion or limitation of incidental or consequential damages, so the above limitations or exclusions may not apply to you. This warranty gives you specific legal rights and you may also have other rights which vary from state to state.